See this? It very well may be my dream dessert. While molten chocolate is nice and all, I am a fruit dessert kind of person. It has its drawbacks, which are that a lot of fruit-centric desserts come in the form of tarts and ice cream. I haven’t run across many desserts that have it all for me: lush cakey-ness, bright fruit taste, and rich without being overly heavy. Leave it to Nigella Lawson to create this dreamy dessert. I ran across this recipe some time ago and stuck it in the bookmarked recipes to be made later tab. This month’s Weekend Cookbook Challenge (hosted by Ani at Foodie Chickie), which was to make a Nigella recipe, was the perfect excuse to give it a whirl. Little did I know that this cake has been made about 234,445,977 times on the Internet – and for good reason. Outside of boiling the clementines, it’s terribly simple to put together – a plus for someone like me with mild baking anxiety. The smell that wafts through your house while the clementines are cooking is dreamy, making this the ideal dessert around the holidays or for parties. Your guests will be a little wowed by the smell as they walk in the door. The results are a pudding-y, rich, flavorful cake that wasn’t all that heavy. Plus, with no flour in the recipe, it’s perfect for those with dietary restrictions. One note about the recipe, I noticed: All of the reviews of this cake scream about how much it sticks to the pan. I did a test of it…and yes…it does. 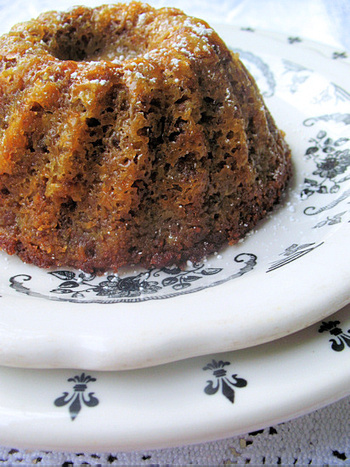 For my cakes, I used small Wilton fluted shaped pans with a healthy dose of Baker’s Joy. They popped right out. Without the non-stick baking spray, they stuck to the inside and fell apart. If you’re using the spring-form pan, I would recommend using the parchment or the baking spray, as well. – Put the unpeeled clementines in a pot with cold water to cover, bring to the boil, and cook for 2 hours. – Drain and, when cool, cut each clementine in half and remove the seeds. – Then chop everything finely — skins, pits, fruit — in the food processor (or by hand, of course). Preheat the oven to 375ƒF. Butter and line an 8-inch spring form pan. – Beat the eggs. Add the sugar, almonds, and baking powder. Mix well, adding the chopped clementines. I don’t like using the processor for this, and frankly, you can’t balk at a little light stirring. – Pour the cake mixture into the prepared pan and bake for an hour, when a skewer will come out clean; you’ll probably have to cover the cake with foil after about 40 minutes to stop the top burning. – Remove from the oven and leave to cool, on a rack, but in the pan. When the cake’s cold, you can take it out of the pan. I think this is better a day after it’s made, but I don’t complain about eating it any time. What a pretty cake! It looks so dainty on the fleur-de-lis plate. Your opening paragraph describes me perfectly. Honestly, I can take or leave chocolate any day of the week. I’d never order molten lava cake. It just doesn’t interest me. Give me a dessert of the sort you describe — tart, rich, cakey and full of nectarines and carmalized sugars, and I’m a happy girl. I’ll try this cake, thank you! Wow, that sounds so great! I come from Sydney where we don’t have clementines (at least I can’t find them) but recently moved to Amsterdam where they are here in abundance so I have been looking for a recipe to use them – this is it! Apparently I’ve been living in the dark because I don’t recall seeing this recipe yet, it sounds wonderful though! i saw the episode where she made this back in the days when they aired her show on the Style channel, and i immediately made it. it’s so good! and i love being able to chuck the fruit in the food processor and letting it rip. i remember the whole house smelling marvelous. i may have to make this again, you’ve rekindled my urge for it. God I love that book! How to Eat is definitely her best book. I haven’t made this but it looks really delicious. It looks nice and sticky – real comfort food! I’ve eaten this and it’s wonderful, though have never made it myself. Looks quite simple, and since there are so many clementines about now it may be high time. I finally have a dessert to end tomorrow’s dinner party. citrus are so abundant right now. i can’t wait!! ha – i made the same cake for the same event, *and* i gave my post the same title. great minds! What a beautiful cake! Thanks for sharing with us for WCC this month.